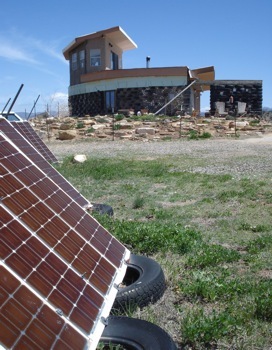 Located close to BLM land with gorgeous views of the San Juan Mountains in southwestern Colorado, this passive solar, modified earthship-style house is off the grid and generates all of its own electricity. 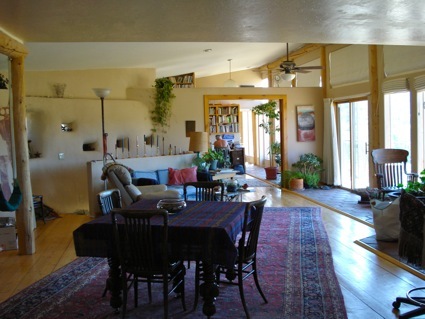 The house is a modified two-story earthship that has a berm around on the northern side of the ground floor. It is situated on an east-west axis with the front of the house dominated by windows that face true south. The rest of the graceful, curving walls that envelop the house are composed of stacked, recycled tires that have been filled with compressed earth. The tire wall is approximately 100 linear feet in length, extends 8 feet above ground and 10 feet below the ground. (Disclosure! I helped to build the back wall of this house. It was my first building experience, as I spent a week with the Krebs in the hot summer sun pounding dirt into the tires.) A compressed air tamper was used to pound the slightly damp dirt into each tire. Michael Reynolds, the inventor / creator of the earthship style of building, has said that about 300 pounds of dirt fills each tire. It really is amazing how much dirt can be used to fill a tire. Approximately 2,000 tires were used to create the structure. When asked about the experience in obtaining the tires, Stu Krebs said, “We went around to tire shops and many of them were really happy to give them away. One shop even paid us to take them.” It saved the tire shop from having to pay a fee to dump them in a landfill. Soon after they started building, they quickly learned that it was a good idea to pick through the tires in order to get obtain tires of a similar size to create a more level wall. The furthest south – north distance within the house is approximately 30 feet. Adobe mud has been used to cover the tires. Tip learned: If building with tires, find tires that are a similar size so that a uniform level wall can be created. Notice the graceful curved wall. There’s tires behind that! Glass bricks were also used between the tires to allow light in. Because it is an earthship-style house, the rammed earth in the tires is the foundation as well as the insulation for the structure. The building is almost entirely composed of thermal mass; in the form of dirt that has been pounded into the tires, while floor at the ground level is a concrete slab (below the one pictured to the right). The main living space on the upper level has a wooden floor with a strip of thick ceramic tile near the row of double pane windows to further boost the amount of thermal mass in the building. A specifically engineered overhang allows the lower winter sun through the windows to warm the structure, while the summer sun does not enter. 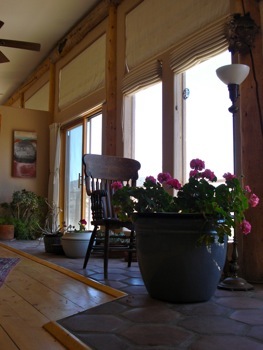 The picture to the left was taken after the spring equinox in April, and shows the sun’s reach in the spring, when only a sliver of sunlight enters the house. Their passive solar house typically tends to be on the cooler side during the spring. The home generates all its power from the sun via photovoltaic panels located on the ground to the west of the home. They use a backup generator when needed. The house is powered by a photovoltaic (PV) array that is located on the ground, a short distance from the main dwelling. The Krebs bought the solar panels and built the frames for them. They built both metal and wooden frames. The metal frames have an open back, while the wooden frames have been painted white and enclose the back of the solar panels. 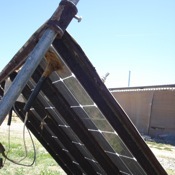 After using the system, they found out that the solar panels in the metal frames are more efficient because they allow the solar panels to stay cooler. 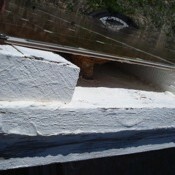 The solar panels in the wooden frame have a wooden back that acts as a blanket layer that causes the solar panels to heat up and do not work as efficiently as the cooler ones. Tip learned: Solar panels that are cooler operate more efficiently. The inverter changing electricity from DC to AC. A corner of the battery bank is in the lower right corner. 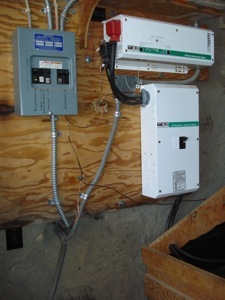 The electricity from the PV array is stored in batteries, then travels through an inverter before reaching the house. When the sun does not provide enough energy for the house, a propane generator is used. 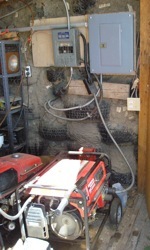 The generators (they have a backup diesel generator in addition to the propane one) are on one side of the wall, while the battery storage, dc disconnect and inverter are housed on the other side of the tire wall. The batteries are stored in the wooden box to the lower right hand side of the inverter and dc disconnect box. The occupants enjoy the natural light that drapes the house in sunlight and have constructed insulated shades to help retain the heat in the winter. While the winter temperatures frequently dip below freezing, when the sun is out, the house is typically around 65. On one of the coldest mornings of the winter, that happened after the sun had not been out for a few days, the lowest temperature in the house was 40 degrees. In the summer time, when temperatures soar above 100, the hottest temperature in the house hovers around 80 degrees. When living in a house located off of the main electrical grid, regular housing appliances are scrutinized more carefully for their use of electricity. After doing research, and debating between a gas or an electric refrigerator, they chose to have an electric refrigerator because they were larger and had more choices available within their design. A refrigerator, however, is one of the appliances that uses a large portion of electricity. Because both a refrigerator and espresso maker are regularly in use in the morning and running at a time when the sun is just starting to provide the potential for solar electricity again, the propane generator is run in the morning to augment the solar electrical system. The generator is run again in the evening to charge up the batteries, in large part to power the refrigerator through the night. 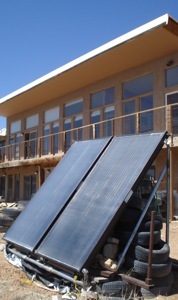 Solar thermal hot water panels supply the household needs for hot water exclusively during the summer, while an on-demand flash propane water heater can kick in when the sun alone can not adequately heat the water. The hot water can also be piped into the ground floor because the cement floor has been plumbed for radiant heat. 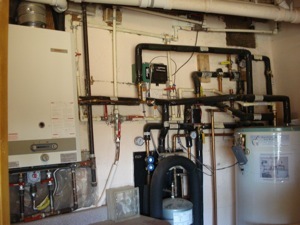 Either the solar thermal hot water or the flash propane hot water can be the source of the in floor heat. The owner builders are still working on the finishing touches of the house. Future plans include the building of two greenhouses that will be constructed on the front of each end of the house. They would also like to add an additional layer of insulation to surround the outside tires in order to create a warmer and more stable inside temperature. A shed that measures 20 by 50 was first built as a test before work on the main house began. The shed, on the left hand side of the picture, because it is smaller, with the distance from north to south being shorter and able to absorb and radiate heat energy more efficiently, is warmer than than the larger house in colder weather. 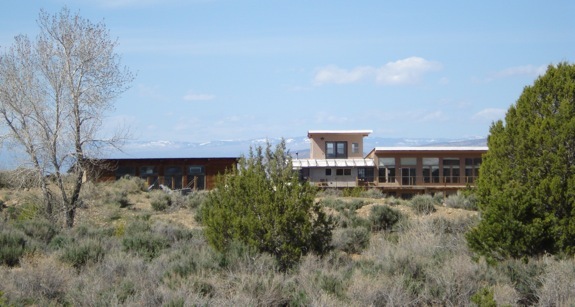 Distance matters in passive solar design. Tip learned: In passive solar design, the depth of the house, from the source of heat to when the heat is absorbed in the thermal mass should be minimized. If you have any questions, feel free to comment and I’ll try to find an answer. I’ve done a section of a tire wall along my property as a test to get a feel for it if I ever decided to build a part of my house out of tires. However, as you probably know not all of the stated tire sizes are accurate when it comes to nominal width (e.i. P215). Is there any other way you came about organizing your tires to put on your wall? If not, do you know of any ways to even out the level of tires? In regard to building a (close to) uniform recycled tire wall, they did have a system to sort through the tires. They explained that there are usually two numbers on the tires: one that indicates the width of the tire, and one that indicates the distance from the outside of the tread to where it meets the trim. They used large tires on the bottom, all of equal size, and used smaller tires, all of the same size on the upper levels. They also used air pressurized pumps, pneumatic tampers (with an air compressor) to pound the slightly moist dirt into the tires. When I worked with them, there were four of us. One person would sort through and pick the tire and stack it on the wall (rebar was also pounded into the earthfilled tires to keep them in place), another person prepared the dirt that would be shoveled into the tires, and there two of us using the pressurized pneumatic tampers to pound at least 100 pounds of dirt into each tire. I think some of the leveling took place by putting simply putting in more dirt into some of the too skinny tires. They were creative in the building process and instead of using concrete blocks at the end of the wall, they sawed tires in half and screwed them onto the adjacent one, then pounded dirt into it. In this way, every other level, the tires could be offset, but end in a straight line. Best of luck and let us know how your project goes. Hi, Just read the info about this house, very nice! We are a group of people who want to build a community house (big family kind of…) for about 8 people, size 2400 sq ft. I wonder where to get design help with this, and, how long it might take to build it and what kind of things to do to speed up the building time? Houses like this can be built more quickly than this one is being built. (They have plans for a two-story greenhouse on a portion of the southern facing side that has yet to be built.) The owner-builders are an older, (yet very active) couple. They are doing most of the work and have a lot of other hobbies on the side, while one is still working part time. A house like this can be built a lot more quickly by building smaller (which it looks like you are planning) and by having a well planned, well built house using readily available materials. There are many things that can factor into the overall time of building a house. In this particular build, they hand – built most of their windows by getting old sliding glass doors, pulled them apart, then built a new frame around the glass. Here is a different efficient passive solar house made out of logs where the builder bought all the windows (double and triple pane). All the work was done primarily by two people, while they each worked other full time jobs. The two houses are approximately the same size, made out of different materials, both owner-built, while one took 10 years and the other took 2 years to build. Good planning, focus and drive each will impact the overall time that it takes to build a house. I’d be happy to help with the design and will get in touch with you via email before the week is over. – With what material did you fill the tires? – What is the lifetime of these tires? and do they need maintenance? – These tires are added as a layer to the original walls? or they compose themselves the walls? Amazingly, moist dirt is pounded into the tires. Pneumatic tampers were used to compress the dirt into the tires, about 100 pounds worth. The lifetime of the tires within the walls of the house will be as long as the house stands. They do not need any maintenance because they are covered by layers of adobe. In this way, they are not exposed to the elements. The tires actually are the support of the house. They have experienced significant settling since they built the house, measurable in inches. Cool eh? How about off-gassing from old tires baking in the sun (even when covered by adobe mud – thermal tromb wall is the point, retain heat through mass and then transmit that heat or energy inside, right)? Has that been studied or are the effects unknow? That sounds like a horrible to find out after you have been living in an earthship home for 30+ years. For this particular home, or any actually Earthship-style building, I don’t think it’s an issue. Because there is a lot of dirt that is pounded into each of the tires in the tirewall, and because it is bermed on the outside, then plastered with adobe on the inside, all that thermal mass helps the building to keep a constant temperature. This keeps the building from reaching high temperatures, and even if it did, it’s covered with layers and layers of adobe. In some cases, the adobe has been painted over, and once dry, paint is yet another layer. It would be interesting to compare the air quality of a house like this, with the air quality in a city. I’d guess that the air quality of a house like this would be cleaner. Yes, the tires in the wall are load bearing and two stories in height. They initially hired a group from the official Earthship building group out of Taos, NM, and their philosophy is that they use only human-powered sledgehammers. The lower floor of tires was hand-pounded and over the years has settled by a few inches. The upper floor was constructed using pneumatic – electric powered compressed air tampers to pound the dirt in the tires, and this process seemed to be more efficient in the process of filling the tires with more dirt. While the settling is not noticeable on the second floor, it can be seen in the ground floor where the adobe on the tire wall has cracked and compressed. It would be great to hear about what type of housing you might built in Mozambique. Maybe strawbale? Best of luck! I would love to be able to converse with the Krebs as I have a project in mind and any advice, even on a one off basis, would be invaluable ! Hi Andy, I sent you an email. I’ve gotten in touch with the Krebs and they are happy to speak with you. I’m currently thinking of building a garage/shed using tyre walls to support it. I’ve done trials pounding tyres with a sledgehammer, but it really takes a lot of time and is very tiring. You mentioned you used an pressure air tamper? How did you get the dirt to properly bulge the tyres? Do you have any more information on this, or maybe some pictures? And another question, do you think it’s a problem, if the soil has very high clay content and is a bit wet? Yes, I’ve come to the same conclusion. It’s a lot of work to use a sledgehammer to pound dirt into tires. When I worked on that house, we used air tampers (this search has a lot of good images of air tampers) to build the second story wall. They, however, hired a crew that used only sledgehammers for the ground/first floor and likely, as a result, they weren’t able to pound the needed amount of dirt into the tire to support the weight of the structure, and over time, the entire structure has settled (by like 5-10 inches). It is noticeable on the second story as the walls have stress cracks. When I spoke with them, they said that they wished that the had used pneumatic air tampers for the whole structure. Because they are electrically driven, I’m guessing here, but I think we were able to get 1/4 to 1/2 more dirt into the tires. With a large family, I have been thinking of building an earthship style home, but I wonder can we have a basement as well? Basements are cost effective ways of adding square feet at a reduced cost. Thoughts? 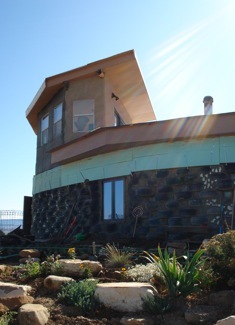 The nature of an earthship-style home is that it is bermed, meaning that one side of it, the northern side, is under ground (or has dirt pushed up against it). This type of home can have additional floors built on top of it, similar to any other type of home. 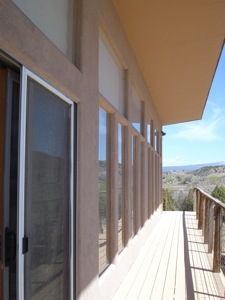 I am looking to build a passive solar – strawbale or rammed earth or ? — duplex in southern Utah. Do you know of any builders in that area with experience in this? I don’t know of any builders there. But if you ask around, they’re usually around. It’s fun to look around for houses that you like, then find out more about it. What they used, what architect or builder they used, etc. Best of luck and be curious and you’ll find all sorts of stuff! 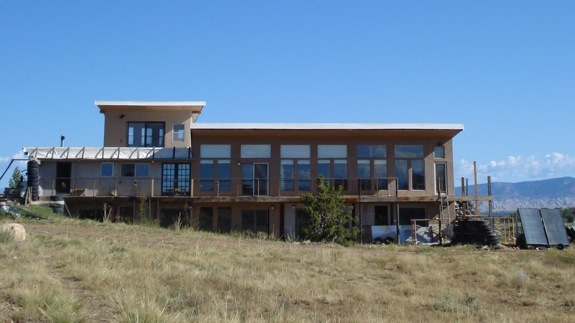 We are building an earthship-style house in Colorado. We have used tire bales in place of rammed earth individual tires. The bales are slightly compressed whole tires bound with steel cables and measure 4x5x5. Each bale contains 100 to 120 tires and weigh approximately one ton each. The bales are placed and stacked on undisturbed earth and then covered in mud, concrete and an adobe mud finish. They are stacked like bricks and then a bond beam is poured to eliminate worry of settling. The bond beam provides structure and is the load bearing wall for I-joists or log vigas/beams or stem walls. The extra thickness of the walls, built into the hill, is massive and with the passive-solar thermal-mass this house stays warm in winter and cool in summer. This way of using the tires is also much faster to build because it eliminates the tiresome rammed earth inside the tires. The tires come baled already from a recycler company (ours were in Colorado) and our state rebated us the cost of the tires for recycling. We filled voids with local mud from the property as well as rocks and cans. We are also off-grid using photo-voltaic solar with a propane back up generator, solar vaccuated tube hot water system to provide domestic hot water and hot tub. Water is from rooftop collection system to sisterns with filtration system. Much research was put into appliances that use little electricity (refriderator and dishwasher) and propane is used for stove, dryer and a back up on-demand hot water heater. Toilets, dishwasher and washing machine were also chosen for water efficiency. The dishwasher only uses 2.9 gallons of water for a standard automatic wash cycle. So far so good. It is a lot of work and research but I guess you could say a labor of love. There are challenges with an unconventional build but if you have the desire, you will not be the first. There are many out there that will offer advice. I was in touch with them and will send you their email offline. Thanks!